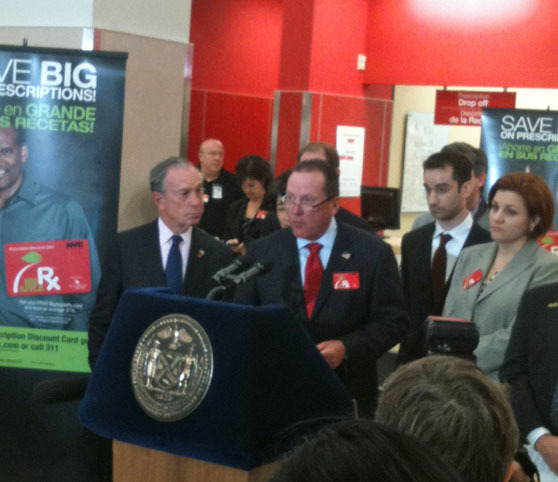 Mayor Bloomberg, Speaker Christine Quinn, Jack McClurg, CEO/Founder of HealthTrans LLC in addition to other administration members, local officials, and others involved in the launch effort held a press conference this morning in the pharmacy section at the Target Store in the Atlantic Yards Mall in Brooklyn to announce the BigAppleRX Prescription Discount Card. The card is a joint effort between New York City and HealthTrans LLC, a leading national provider of affordable healthcare options through its discount prescription and healthcare programs. The discount card is available free of charge to anyone living, working or visiting New York City and provides various discounts for prescription drugs and certain other designated over the counter drugs through approximately 2,000 participating pharmacies in the city. It is primarily for those who have no insurance coverage for prescription drugs as it cannot be used in conjunction with any other insurance plans or discount plans. Capalino+Company is the Government and Community Relations firm representing HealthTrans in their efforts to launch and market this card in the Metropolitan New York City area.